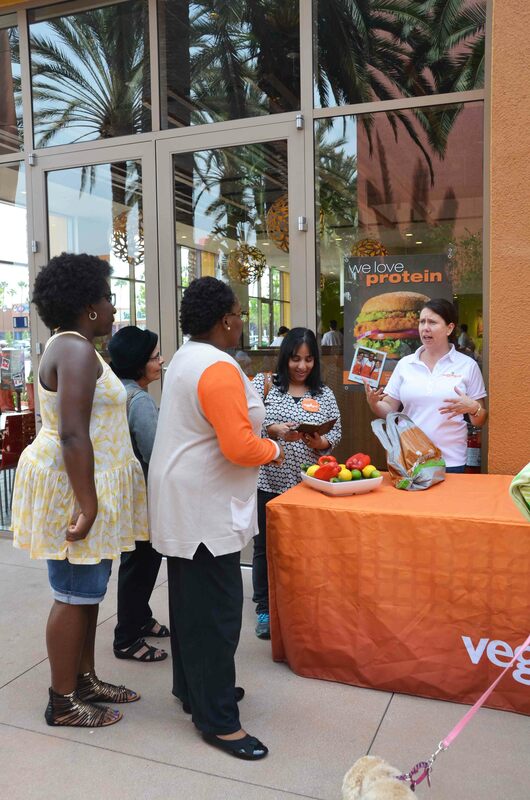 We were invited to the grand opening of Veggie Grill’s newest location at the Irvine Market Place. 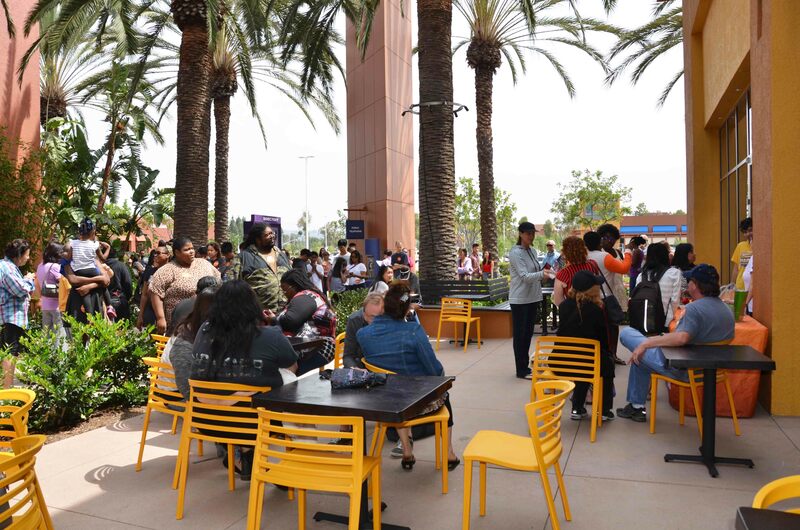 When we arrived, a line of eager patrons were wrapped around the building. Who wouldn’t want to eat healthy, great tasting food and with their new summer menu you have so many more amazing choices. I have to say that this new menu is my favorite to date and I highly recommend you checking it out. 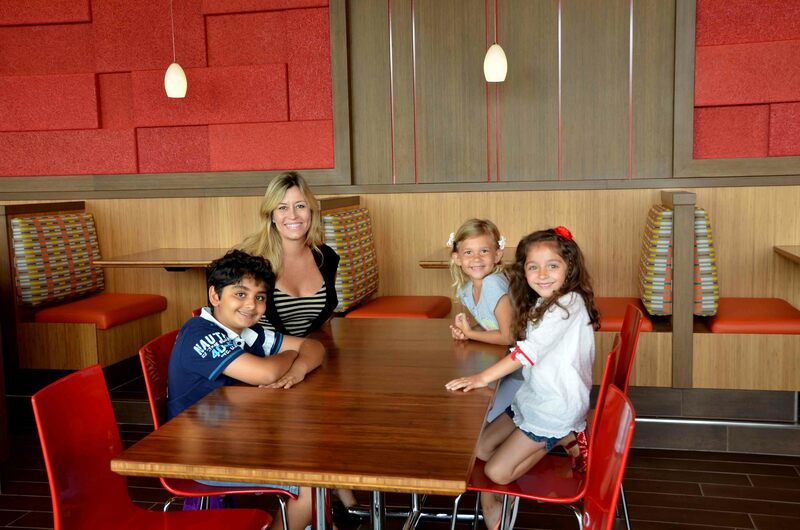 I knew what was in store for me so I invited my fellow OC Mom, Chantile to join me for an amazing time. 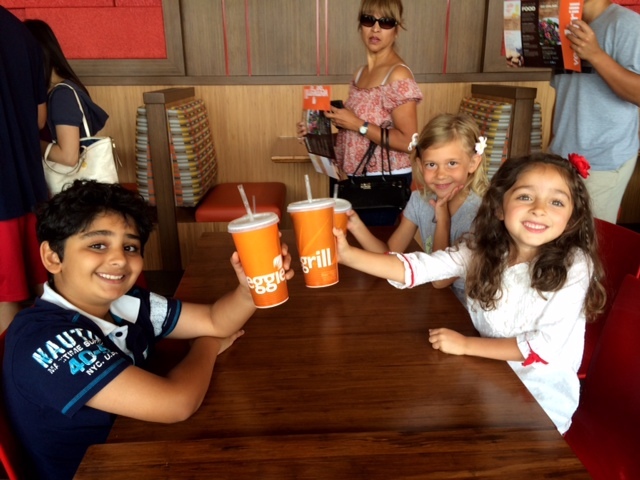 She hadn’t been to Veggie Grill before but after our visit she became the newest convert. Once you try it, you get hooked. 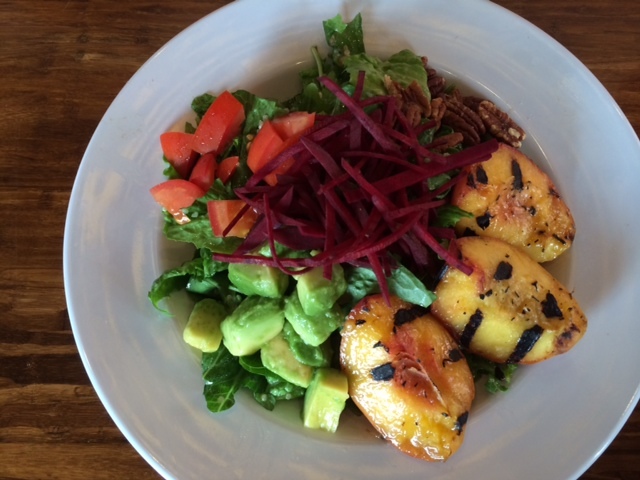 Again tasty, healthy, organic meals all made fresh to order – how can you go wrong? 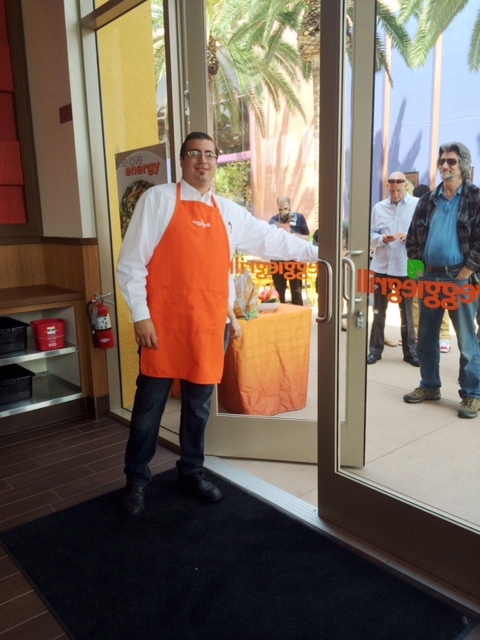 We got there right when General Manager Rick let the long line of Veggie Grill fans in. 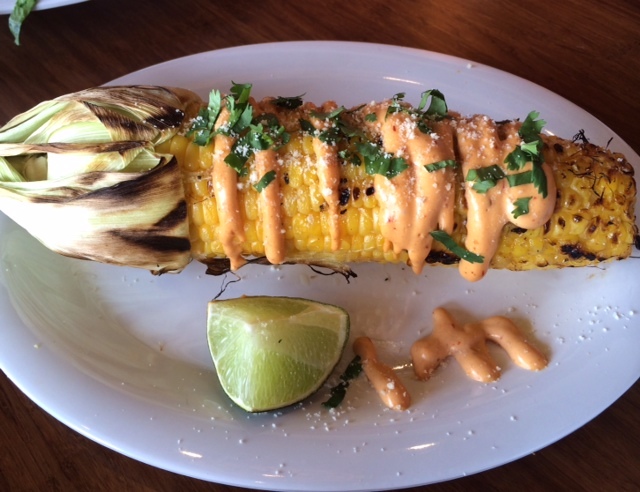 We started off with the Chargrilled Street Corn: grilled sweet corn drizzled with southwestern mayo topped with soy Parmesan and cilantro. A creamy sauce with a kick, the southwestern mayo was so good that Chantile and I took some home. 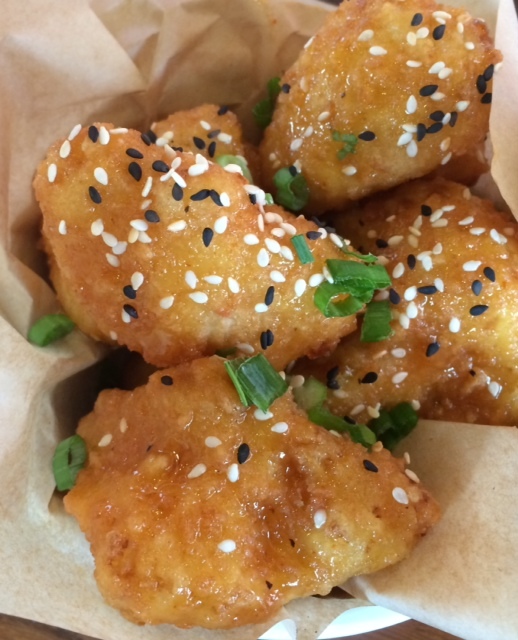 Next up the Crispy Cauliflower: sweet and spicy, orange glazed florets in panko breading. I love cauliflower but my kids don’t. They loved the florets covered in the sweet and spicy sauce – whatever they did worked to get my kids to eat the cauliflower which makes me happy. The Seasonal Harvest was refreshing and fulfilling to say the least. 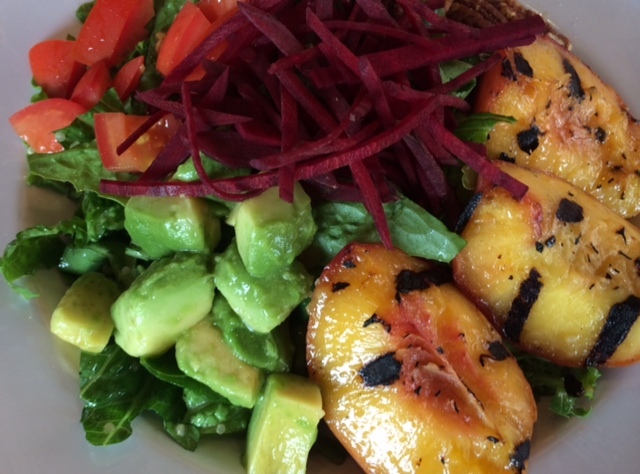 Fresh chargrilled peaches, tossed arugula and romaine with roma tomatoes, shaved beets, roasted pecans on a bed of infused quinoa with citrus vinaigrette is a perfect meal on a hot summers day. The next two items are officially my favorite meals and I hope that these two are permanent meals on the menu: Latin Succotash and Grilled Portobello Skewers. Just writing their names are making my mouth water. The Latin Succotash is as colorful as its name. 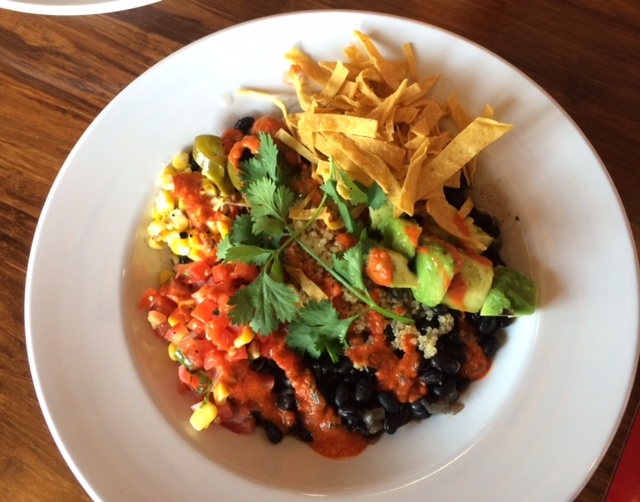 Seasoned black bean, shaved chargrilled cob corn, avocado chunks, tomato corn salsa, jalapenos, tortilla strips, red paper chile sauce layered over quinoa pilaf with dried grapes and almonds. AMAZING!!! 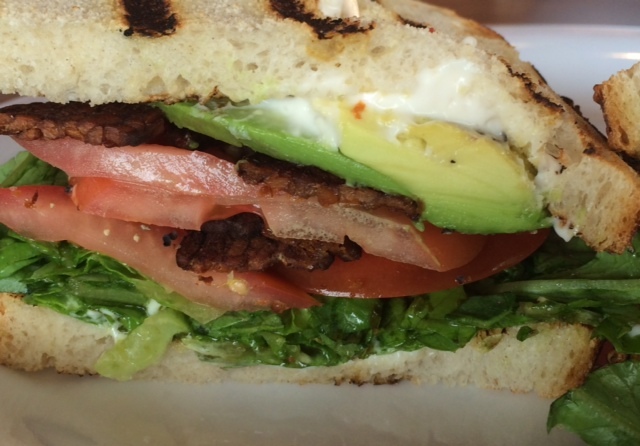 It’s so good you can’t believe it’s healthy and like the seasonal salad so fulfilling. 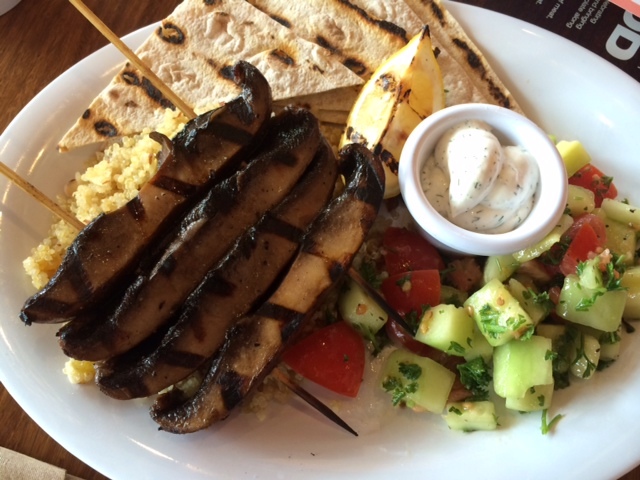 The Grilled Portobello Skewers is a must for the mushroom lover. 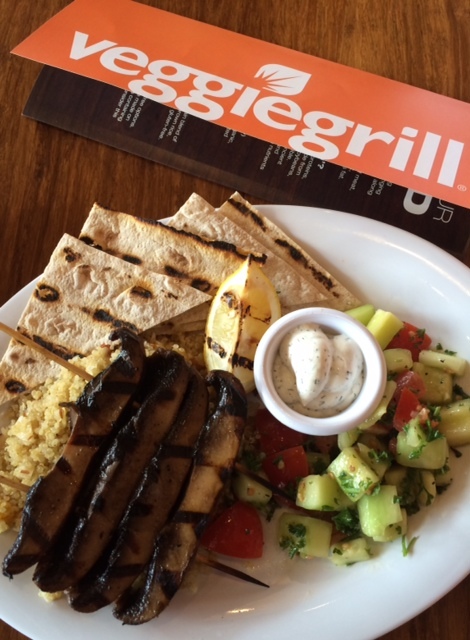 Tamari-marinated chargrilled Portobello strips on a bed of quinoa pilaf, with a side of Mediterranean cucumber and tomato salad, lavish and the best tzatziki sauce I have ever had, make this meal a must. My only advice is to add a bit of salt and pepper to the Mediterranean salad other than that this meal is pure perfection. The B.T.L.A was the one and only B.T.L.A that I have eaten that hasten given me a tummy ache. 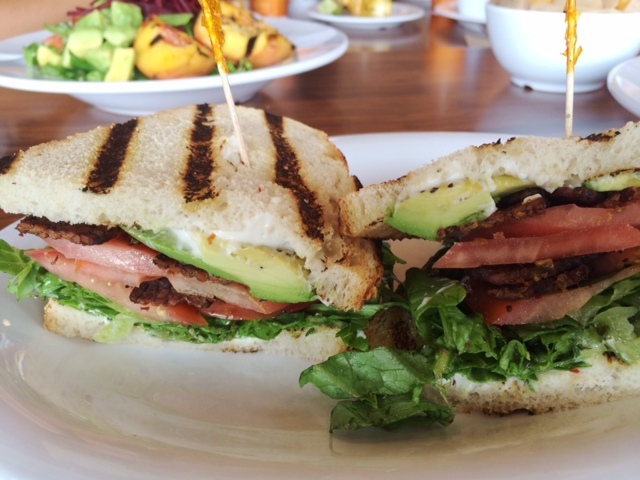 I love real bacon but too much of a good thing makes me sick so the best way to have the bacon taste but not the effect is have this fabulous sandwich and it comes with a side of Yukon fries, score! Last but not least was dessert, Fresh Peaches and Cream. It’s a seasonal dessert and will only be around for the next couple of months. Sliced and grilled peaches covered in cinnamon and topped with VG-Crema. 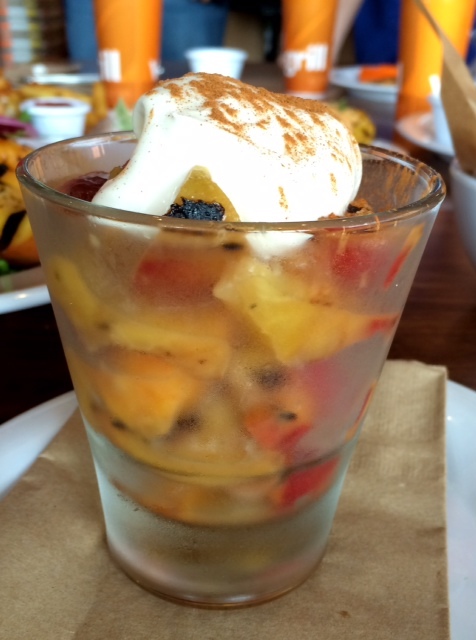 Light and flavorful, this is one time that you won’t feel guilty have a treat. 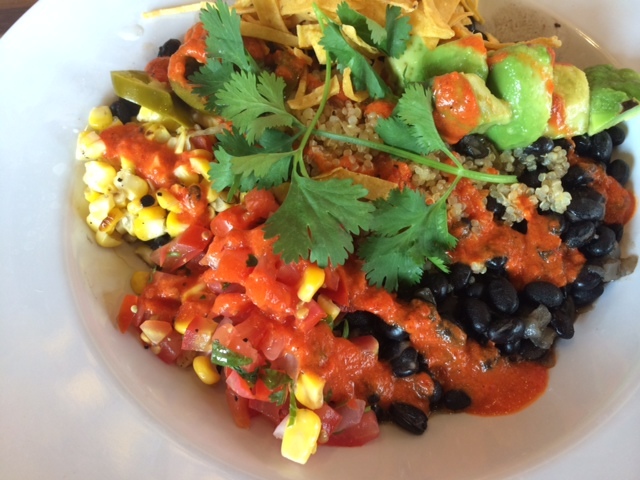 The summer menu is out now and I recommend you going to Veggie Grill and trying out all their new items. 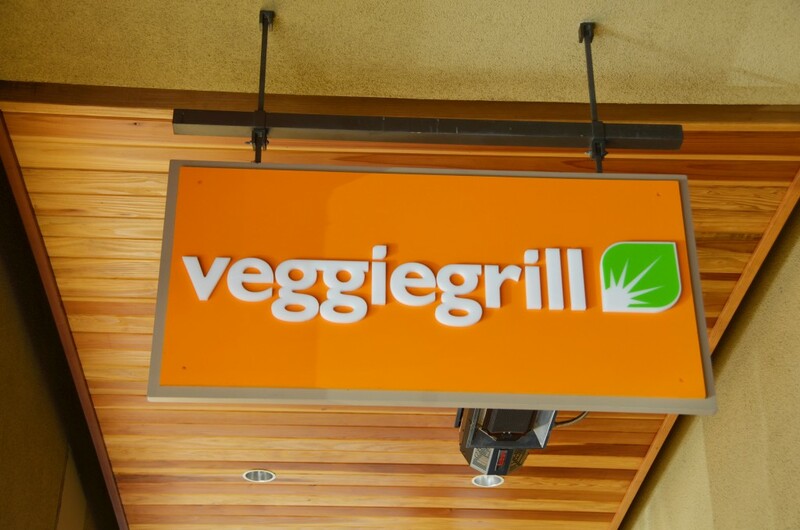 Check out their website http://www.veggiegrill.com/visitus.html for a location near you and make sure you visit their newest location in Tustin.